Lauren was in the 8th grade when her brother, Will, set the current boys' pole vault record of 14 feet. One of her goals coming into high school was to join her brother on the record board. 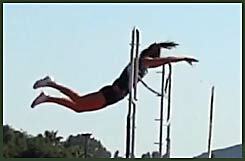 As a freshman, she made it to the 2011 CIF finals where she cleared 9 feet 9 inches. In 2012 she PR'd at the Frosh-Soph meet with a vault of 11 feet 4 inches thus realizing her middle school goal of the Bartch siblings owning both school pole vault records. Her current record is 11-5 set in 2013 at Mt. Carmel. With a background in gymnastics and, like the former record holder, a cheer flyer, Lauren has the tools to be one of the top female vaulters in the county for the next two years. Click on the image above to see a video of Lauren setting the school record at the 2012 Frosh/Soph meet. Lauren on the podium at CIF Finals 2012. 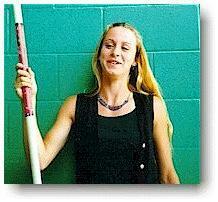 Danielle Eckert set a new Pole Vault record in 2005 of 10' 0" at the CIF finals. Her best vault was in 2007 at the league finals at Cathedral Catholic where she vaulted 11-3.Danielle was recruited from the cheer team where she was a "flyer" so she was used to being upside-down and in the air. She caught-on quickly and by her sophomore year she had the school record and kept it for the next seven years. Lisa Robbins didn't know what event to try when she came out for track in her freshman year so we tried just about everything with her including the pole vault. Although her best freshman vault of 7' 6" was a bit short of spectacular she decided that this was her event and she came back as a sophomore much faster and stronger to become one of the top sophomore female vaulters for 2002. 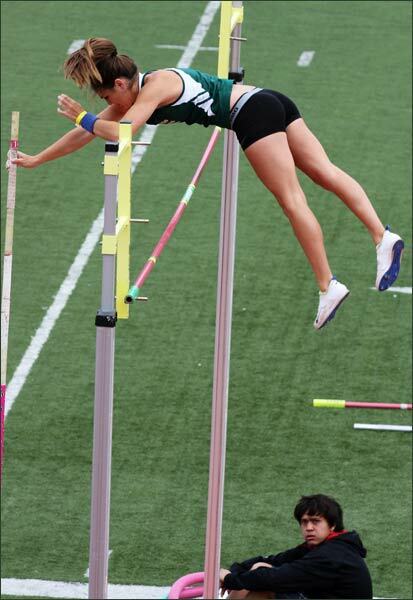 Her record vault of 9' 6" was in a dual meet against Madison. Unfortunately she went to another school the next year because of a family move where she vaulted even higher. Erin Johnson came out for track her senior year with no idea of what she could do. She did, however, have a background in both gymnastics and karate. This obviously worked in her favor because by the end of the season she had established the school's pole vault record and won the 1997 league title.